This production technology guarantees high durability of the advertising installation. Here is how we made it. The face of the menu is made from high-quality Plexiglas that is applied with a self-adhesive film, designed specifically for illuminated signage. The special aluminum snap systems ensure fast and easy switch of the printed graphics. Even non-professionals can easily change the advertising message. The illumination of the advertising installation provides an even more impressive appearance of the ad. The G.O.Q. LED modules are embedded in the construction of the aluminum snap profile. They ensure bright and even illumination of the ad. Using high-quality LED lighting is proven to be the most cost-effective illumination method. In reality, the LED modules consume electricity as much as a standard light bulb. That is why they are highly preferable. 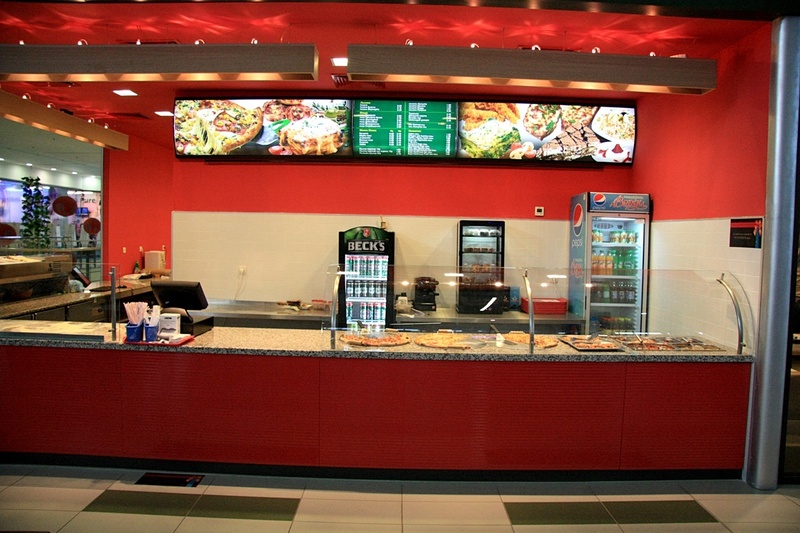 The stylish and attractive design of the illuminated menu is perfectly combined with the interior of Pizza Verdi.